BLOOMINGTON, Ind. 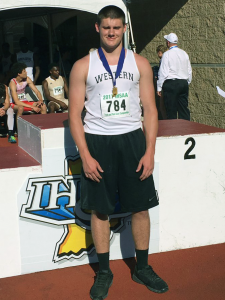 – At the 114th Annual IHSAA Boys Track and Field State Finals on June 2 at Indiana University in Bloomington, Western junior Tyler Gilbert did something no Howard County student-athlete had done in 105 years – stand on the top of the podium for discus. Gilbert’s first throw turned out to be the best of the day at 173-10. His next five tosses included a foul, 151-08, 165-10, 168-07 and a foul. Tyler Emberton of Whiteland threw a 173-09 on his fifth attempt to claim second and Logan Calvin of Bloomington North was third with a throw of 171-03. Gilbert became the second discus state champion to hail from Howard County and first since Kokomo’s Ken Dewees heaved a throw of 103-5.5 to win in 1912. He is the third Western Panther to win a track and field state title, joining Michelle Faulkner (800-meter run in 1989) and Brandon Youngdale (high jump in 2006). He is Howard County’s first track state champ since Eastern’s Grant Cole stood on the top step in the long jump in 2013. Gilbert was not the only Panther to earn a podium finish in Bloomington. Senior Josh Everetts took home a seventh-place finish in the 1,600-meter run with a school record time of 4:15.54. Everetts broke the 12-year-old record set by Kyle Walsh (4:15.95) at the 2004 state finals. Everetts also ran the 3,200-meter run, finishing 27th (10:28.10) after developing a blister during the 1,600. Junior Aren Turner of Eastern also participated at the state finals, but did not clear the opening height in the pole vault. Carmel won its third consecutive team state championship with a score of 69. Avon was second with 47, followed by North Central (43), Chesterton (37), Fort Wayne Northrop (32), New Palestine (26), Center Grove (23), Evansville Harrison (22), Bloomington North (21) and Warren Central (20). Western scored 13 points for a 14th place finish. Parker Jones of Pendleton Heights earned the Robert S. Hinshaw Mental Attitude Award. Kokomo freshman Tionna Brown’s incredible first varsity sprint season came to an end with a pair of podium finishes at the 44th Annual IHSAA Girls Track and Field State Finals on June 3 at Indiana University in Bloomington. Running in her first state finals, Brown broke to Lady Wildkat state records while running against one of the best sprinters the state of Indiana has ever produced. Brown took fifth place in the 100-meter dash with a time of 11.99 after breaking her own record in the trials with a time of 11.79. Later in the meet, Brown ran a 24.64 to take home fourth-place in the 200-meter dash. In the trials, she set the school record with a clocking of 24.12. Brown was up against a stiff field, including a senior who became a legend. Pike senior Lynna Irby completed her amazing career with a fourth consecutive sweep of the sprint events. Before finishing her four-peat in the 200 and 400-meter dashes (with times of 23.41 and 53.81, respectively), Irby broke her own state record in the 100 with a blazing time of 11.41. She finished her high school career with a record 12 state championships, surpassing former Olympian Maicel Malone of North Central (Indianapolis) and setting a record for most sprint championships, most individual titles and most career crowns. Kokomo senior Lana Pham, the KHS class of 2017 valedictorian, earned a third consecutive state finals berth and cleared 5-2 to finish 18th in the high jump. Warren Central captured the team state title with a score of 55, followed by Hamilton Southeastern (46), Brebeuf (33), Ben Davis (31), Pike (30), Crown Point and Fort Wayne Northrop (29), Zionsville and Fishers (27), and Noblesville and Carmel (22). Kokomo finished in 20th place with 11 points. Madison Kiser, a senior from Pioneer, completed her own back-to-back victory in the 800-meter run with a winning time of 2.11.96. Kiser, an impressive student-athlete and leader in the classroom and community, was also named the recipient of the IHSAA Mental Attitude Award following the meet. She is no stranger to Howard County, having won multiple titles at the Western Sectional. This entry was posted in Eastern, IHSAA, Kokomo, Western. Bookmark the permalink.